You may have a new ally in the ongoing battle to keep your skin firm, glowing and blemish free. I'm talking about bee pollen, the nutrient dense superfood from the hive that is changing the rules when it comes to keeping your skin healthy in a natural, holistic way. As it turns out, bee pollen is loaded with 'skin health' boosting substances like zinc, silica, and dozens of anti-oxidants and fatty acids. "My wife is 63 and looks like she is in her 40's. (this from her friend's compliments) She can still wear the same dresses she wore 35 years ago when first met me. Her secret - she and I started taking bee pollen 30 years ago." It’s funny because I have always had sensitive skin and felt that anytime I touched my skin, I would get a pimple. As a result, I never used a lot of cosmetics. I also never really thought of myself as having really nice skin. Instead, I used bee pollen and our Miracle Cream, which contains bee pollen, among other things. But so does your lifestyle and drinking a lot of water as well as taking really good quality healthy fats every day. For example, I also use GLA Skin oil and a product called Collagen Plus. In fact, I have a whole list of recommendations for beautiful, radiant skin. Is Bee Pollen Anti Aging? 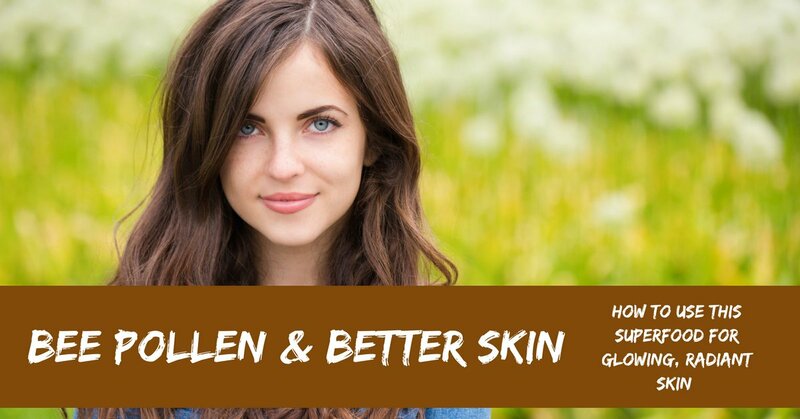 Your skin can become younger looking and less vulnerable to wrinkles, smoother and healthier with the use of bee pollen (both internally and externally). Due to its high content of Nucliec Acids (the building blocks of RNA and DNA), Bee Pollen will prevent premature aging of the cells and stimulate the growth of new skin tissues. 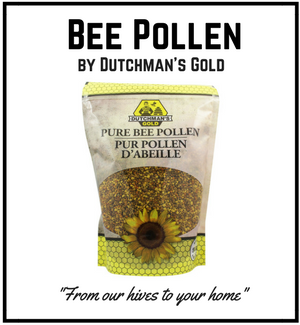 When Bee pollen penetrates the skin it automatically nourishes the cells and tissue beneath the skin. It can act as a moisturizer for dry skin and wrinkles and creases. As well as bee pollen, I also use our Natural Beeswax Body Cream for skin health. It's paraben free and contains no fragrances so it won't increase your toxin load one bit. Of course, I still take my bee pollen internally every day as well which compliments this wonderful beeswax skin cream. Below is a testimonial from a customer of ours and her experience using bee pollen for dermatitis. Dermatitis is often caused by immune dysfunction so it comes as no surprise that bee pollen helped treat this issue. Bee pollen is a wonderful immune tonic, meaning it helps to modulate or balance out the immune system. Well, my friend told me about your products long ago and I never followed up until recently. But even then, my intent was to use your products for general health and strengthening of the immune system. I never thought it would help getting rid of the periortal dermatitis, but it did!! I used your bee pollen, 1 teaspoon in the morning and one teaspoon before bed. In just one day, yes, I am not exaggerating, in one day, the sores felt softer and not itchy. In 4 days it cleared up completely. I was still not truly believing it and gave it time, but it's still all gone! So, I ordered a much bigger order of many other items you sell and received my second order and will be ordering continuously! Thank you very much!!! Many blessings to you and your business!" Sincerely, your loyal customer A. G.
If you'd like to maximize the skin healing powers of bee pollen, this honey bee pollen facial mask is an absolute must. This mask will treat dry skin, eliminate acne and scarring, increase moisture content and slow the aging of your skin. 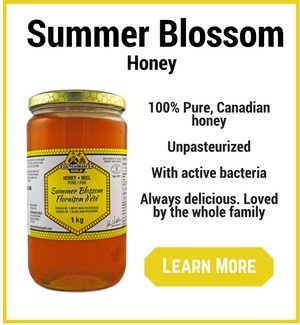 1 tablespoon of Raw, unpasteurized honey. 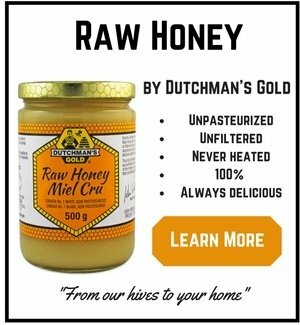 I recommend Dutchman's Gold Raw Honey. 2 tablespoons of Bee Pollen Granules. Soak the bee pollen in water overnight for best effect. By soaking in water, the bee pollen will begin to dissolve and will be softer on the skin. Keep all of the ingredients at room temperature. Blend all ingredients in a blender. Be sure to blend it well. Now clean your face and throat thoroughly. With fingers apply the mask. Leave on for 20 minutes, and then rinse with warm water. Then add just enough Witch Hazel to fill an 8 oz cup. Stir vigorously with a spoon or in a blender. Refrigerate until tingly cool then apply with a cotton ball to your face and throat. Leave on for most of the day. Add a few drops of lemon juice and a teaspoon of Bee Pollen to your favorite shampoo (dissolving the bee pollen in water overnight before adding to your shampoo makes for a better effect). Use as usual. Your hair will be left with a lovely shine! To further beautify your hair, I use and highly recommend the supplement Collagen Plus. It's also marvelous for your skin and nails. To incorporate bee pollen into your skin health program, give my Bee Pollen Skin Booster a try for 30 full days. 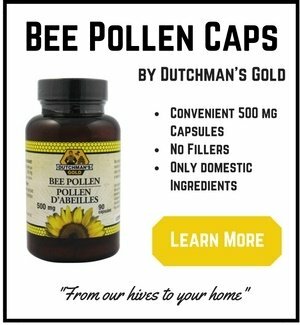 Bee Pollen Capsules: take three 500 mg bee pollen capsules per day for increased skin building minerals like silica and powerful anti-aging anti-oxidants. It is important to remember that your skin is your body's largest organ and must be cared for internally as well as topically. Bee Pollen Skin Cream: Replace your current moisturizer with a bee pollen based cream. 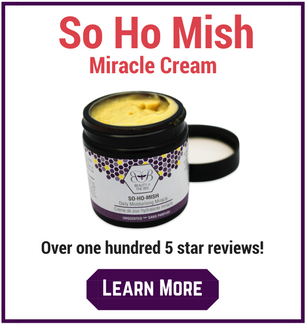 I use and highly recommend the So Ho Mish Miracle Cream which contains bee pollen. Apply it twice daily as a morning and night cream. Bee Pollen Soap: Most of your soaps will contain chemicals and abrasive substances that will actually dry and damage your skin over time. Use a soap that is 100% natural and contains bee pollen along with other skin health boosting nutrients like natural beeswax and honey. 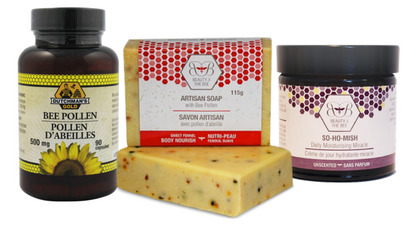 I use and recommend Beauty and the Bee's Body Nourish Bee Pollen soap.